Autumn Spencer is blogging for parent.co Check out her first piece here! Thrilled to report that Sue Schmidt was crowned winner and audience favorite at the Extempo Tournament of Champions at the Tell-oFf as well as the number one storyteller by New England Public radio Best of the Valley Voices. Well done, Sue! -The DIVAS HAD A BABY!!! 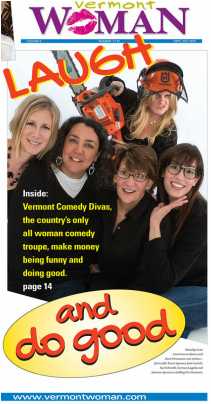 Hilary Boone is officially the newest Vermont Comedy Diva! -Tracie Spencer on Fox-44 talking about our January, 11th, 2014 Divas Do Good show for ReSource. Higher Ground Comedy Battle? Check this out. Teaching stand-up to prisoners and homeless kids, got Josie Leavitt this press coverage. seven hot comics to watch during the Comedy Festival. Our first ever Divas Do Good Show press coverage.